Shear Jazz was established in 2006 by Zina Mayer and Jennifer Naaktgeboren with a combined total of over 45 years experience in the beauty industry. We wanted to create a relaxed and up to date atmosphere for our clientele. We only employ stylists with a minimum of three years experience. 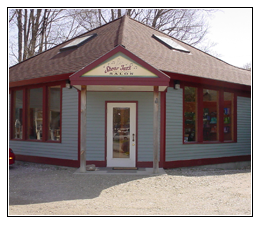 Shear Jazz was voted #1 Hair Salon for the years of; 2009, 2010, 2011, 2013, 2014 the readers choice of bennington banner. Continued education is a must for any employee of Shear Jazz. Therefore, Shear Jazz sends stylist to New York City and Paul Mitchell schools. Paul Mitchell has recognized Shear Jazz as one of the leading salon in the industry and as Named us a Paul Mitchell signature salon. This enables our employees to keep up with the rapid changes in the beauty industry and better serve our clients. Make an appointment today by calling: (802) 440-9880. We look forward to seeing you soon.